Autumn’s gentle footsteps traced a path, follow. The outside world washed in riotous colour and crisp, cool air. Red, oranges, and yellows canopied the sky. “Come wonder,” it coaxed. Leaves drifted to the forest floor; berries, their ruby-red and white heads shyly peeked through the hedge. Chestnuts clunked, their mahogany, soft; a mystery some still asleep within spiny pods. Acorns, twirled, dropped and rolled. Flyers drifted from the limbs of the maples that lined the boulevard. One last brilliant show before winter’s frost settled and cold, quiet stillness blanketed the land. It’s almost time for tricks and treats! 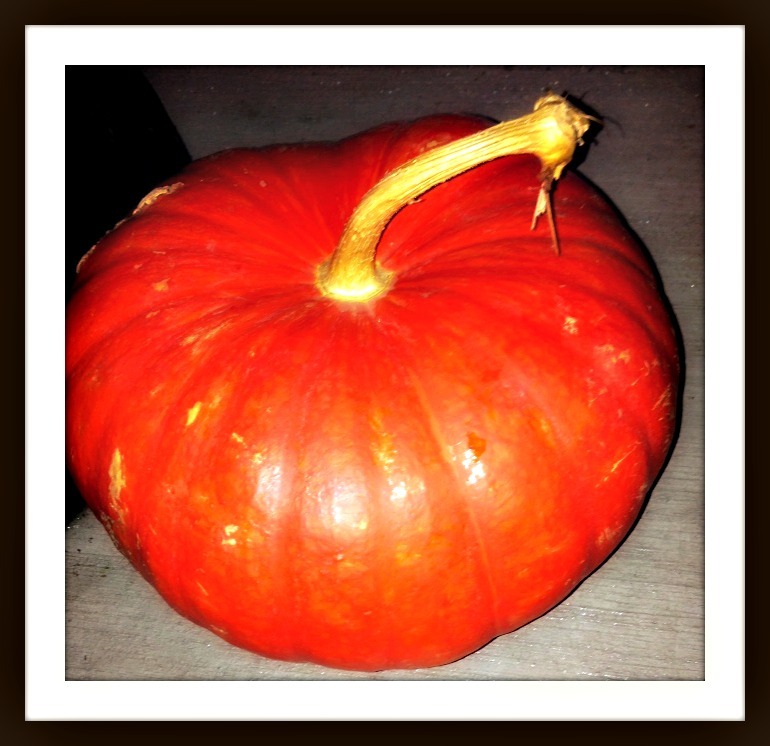 I recalled a time from long ago; a woman gathered her young, headed to the pumpkin patch. Once there, they raced from the car. An autumn search for the perfect shape, the twisted stems, pieces of curled vine. Scampering rubber boots flashed between the rows and rows of orange globes that lined the muddy field. The children’s delighted squeals upon discovery, “Who can lift the heaviest pumpkin?” Tumbled, twisted, dropped and thunked, the enormous globes rolled toward the parking lot. Eventually stashed muddy and safe within the trunk of her car. Autumn is a relentless tease; it whispers forth. Sunday slowly is how the morning unrolls. I find myself at a local garden shop hoping to recapture the magic, oh so long ago. Orange lanterns bow their paper-thin heads as I pass through the shop’s doors. Potted chrysanthemums line the cement floor that leads me deeper into the shop. Skeletons dangle and dance, suspended from the ceiling, bejewelled skulls adorned with sparkling silver crowns leer from the open shelves. Woodland branches and twisted willows reach forth from enormous cast iron urns. I round the corner and spy them piled; plentiful orbs of orange and red, some white, even blueish grey. Smooth, freckled, knobbly, flat, bruised and glorious. The Cinderella white one catches my eye. I imagine it transformed into a horse-drawn carriage once the street lights turn on. The brilliant red squash, its twisted husk topper, nature’s after thought, is added to my basket. 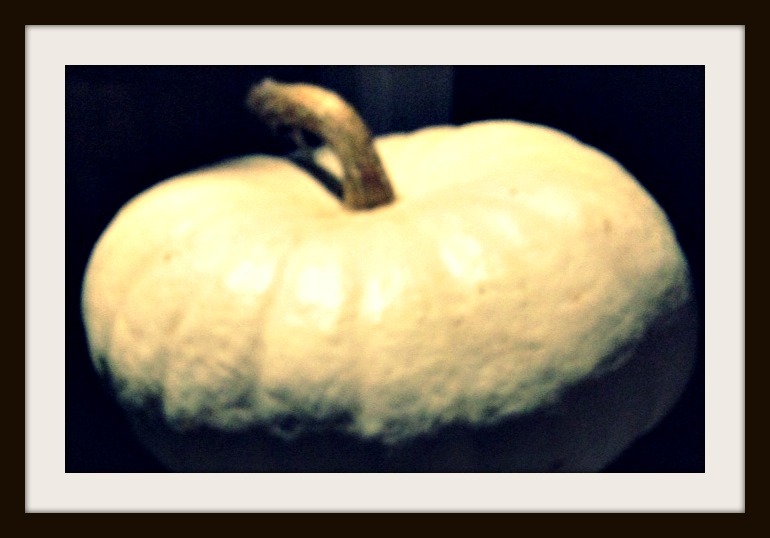 Headed toward the cash register, a tiny, white ghost pumpkin called out. Welcome to the grouping. Once home, two pumpkins and a stray Manx grace the landing. “Cinderella” perches atop a small black urn on the table just inside the front door. Touches of rustled autumn beauty remind me and all who pass by that this is a magical month awaiting discovery. Beautiful. You make me want to get out my fall decorations. I have! A sparkly skeleton graces the front door, a pot of mums and of course, pumpkins. You must admit, autumn is a “pretty” season! Lovely post, Grace, and I love fall and it’s gorgeous, rich colors. We’re still having “summer” here, though, and we’re definitely ready for some cooler weather. 🙂 We just started putting out some Halloween decorations, too, and I bought some candy that is hidden until the 31st; will have to buy more later. Anyway, enjoy! Hi Lauren!I agree; autumn is a gorgeous season and I’m all about the gorgeousness effect! Can’t help but decorate with nature’s fallen bounty and beauty. I’m hoping that my pumpkins survive until Hallowe’en and that the pumpkin smashers stay away. The candy- well that won’t last long around me! I’ll buy it on the 30th for this reason! Thanks for commenting and “love” your writing! We just dove into one of the bags, oh no! 🙂 usually wait until just before the big day, but thought I would start early. Thanks for your complement, too! Gorgeous! There’s so much I love about this – that first line, autumn whispering forth, sunday slowly…beautiful. Thank you, Andrea! Isn’t writing such a funny craft? Some days the words come forth so easily, other days…!